I reply that they are just sitting there quietly, not even taking up space that his 6 feet tall frame needs. So what’s his problem anyway?? He tries to shove them off the bed and succeeds in throwing one on to the dressing table! I am horrified. I go and get Teddy back and put him alongside Pinkie. Poor thing! How hurt it must have felt, sailing through the air like that and landing with a thud! Pinkie, I notice has that forever-perplexed expression. Seemed to suit the occasion though. L&M is pleased that he got the chance to send one of them flying through the air and laughs contentedly. “Jealous!! That’s what you are! Jealous of Teddy and Pinkie, my darlings!” I tell him. “Jealous of your dumb stuffed toys?? Ha ha! !” He pooh-poohs the idea. “Dad didn’t mean that darlings!” I tell my little friends and look at him reproachfully! “God! !” he says and rolls his eyes. Teddy smiles back cutely as he always does. Pinkie still wears the perplexed look. This is routine, whenever the Master is home. He tries to shove them off the bed and I insist on having them back with me. Well I am thankful he suffers me for all the foolish games I play. He is sporting enough and plays along pretending (Hmm… pretending, I suppose??) to be jealous of them. Whacky?? To the core!! That’s me!! Everyone agrees on that. So where’s the problem anyway?? Now how did I come by these cuties? “Some music!” Wide grin at the thought of more music for my collection. “That’s what you always get from me!” says Son Senior. “Can’t you think of something else? ?” he asks. I try hard but cannot come up with anything I want more than that! “Well let me think it over!” says he and pushes off. Meanwhile, Son Junior has decided that he is going to buy Mom the latest collection of ghazals from Jagjit Singh that has hit the music stores. So off we go shopping. He wouldn’t be content with only that. He wants to splurge the whole of his pocket money on Mom. I don’t want him doing that. But would he listen?? Oh no siree!! So it was the ice cream shop next and a sundae for Mom and sonny boy. Then he also gets this lovely card. I new his purse was empty at the end of it all. But his heart was full, so I let him be. It was late evening when the two of us got back home. Son Senior was not home yet. L&M, Son Junior and I were in the kitchen when he turned up a little later, with this parcel all wrapped up in colorful paper. I was curious. What could it be?? No clue whatsoever did I have. I tore off the wrapping and a little bit of soft yellow fur was revealed. My neighbors have registered a formal protest with the Residents’ Association here about the scream/shriek they heard on the said day. The fact that it had been a scream of joy moves them not a bit. They say that their eardrums come first and my spontaneous joy has to find other means of expression! Sigh! And now, what about Pinkie?? Teddy was all alone! I dropped hints as huge as bricks. But did L&M have ears for that?? Oh no! He was already into Send-Teddy-Sailing-To-Dressing-table routine. With another on the scene, his share of me was going to be even lesser!! But someone had been listening!! On my 47th birthday (the spacing was just right!! Hehehe…) Son Junior comes home with another of those colorfully wrapped packages. My heart dares to hope. Is this it?! Is another one on its way?! I open the packet and there staring back at me with a perplexed look was Pinkie. This time I was cautious. There was only a muffled exclamation of joy. I must be careful of those protesting neighbors with the sensitive eardrums!! Now they sit together on my bed. When I am not around they have each other for company. Teddy and his little sis Pinkie!! Teddy & Pinkie looks so cute. No matter what age you are, Teddy bears have a way about them that always seem to put a smile on your face. They spread warmth and good cheer wherever they go. 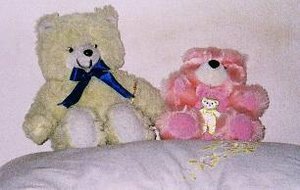 Hello Teddie and Pinky…. Nice to meet you.I too have an orangey softy dolly in my room… a bday gift from my MoM. A suggestion: Secretly enroll Teddy and Pinkie in a self-defense martial arts class at least six months in length requring karate uniforms. I suspect that after they graduate with their new combat skills the situation will change. When Teddy or Pinkie or both jump on L&M after he tosses them away, L &M will have to examine new strategies for “settling geographical arguments” with them. L&M must live in harmony with Teddy and Pinkie or at least pretend to, no? To continually be overpowered by two stuffed bears of such tiny dimensions is not going to be an acceptable alternative for L&M. Vikram: Agree with you. They do put a smile on faces, these cute soft toys!! Bob Hoff: Wow what a suggestion!! I am on the look out for someone to train Teddy and Pinkie in martial arts. Ahem… Is a certain Retired Park Ranger interested in taking up the mission?? i have the same Teddy in my room! !but yours looks more nice!! What a wonderful narration Shail. It really made me laugh to just visualise the poor Teddy flying through the air and Pinkie with her perplexed look. How sad, the poor little soft ones. I can quite understand your protectiveness about your two little softies, but your sons oh they sound even cuddlier and cute!! Really, how lucky (touch wood!) you are to have 2 caring sons who give you teddy bears for your bday. No wonder the neighbours eardrums split! Ha ha. I feel like pulling their cheeks really but they will revolt, na?? Haha, of course they’d revolt if you try anything of the sort! !